I keep track of new kids books I want to read and review over here. It beats the hell out of a virtually overflowing Amazon cart. About a month ago, I brought home a brand new picture book from my list, which my 5-year-old son made me read no less than 723 times. This means he really liked it. So, I checked out two other related titles, and then we read them an additional hundred thousand evenings. And, guess what? I still really like those three books! The fact that I don't want to lock myself in a closet at reading time each night means that these books are pretty much completely awesome. 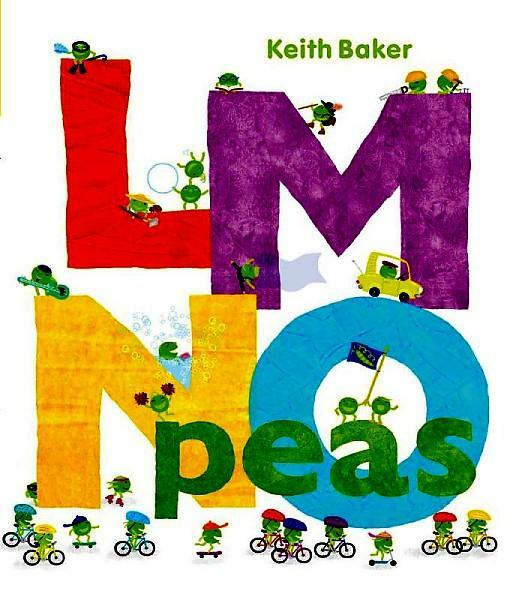 Keith Baker, a former elementary school teacher and picture book author/illustrator, published a very original alphabet book titled LMNO Peas, to rave reviews four years ago. It not only received several starred journal reviews, it was named a best book of 2010 by multiple list makers. Because that book was so successful, 1-2-3 Peas was published in 2012. That book got even more starred reviews. Now it's 2014, and Baker just released Little Green Peas: A Big Book of Colors. And you'll never guess ... but, this one is garnering superb accolades, too. It's hard for me to pinpoint why these books, which are in essence basic concept titles for kids two to six, are so unique and appealing. We all know there are hundreds of alphabet, counting, and color-teaching books out there. I think it really boils down to one thing: Peas, those vegetables that many preschoolers refuse to put anywhere near their mouths, are actually very, very cute. Especially when anthropomorphized in miniature, with endearing little stick arms and legs, and energy reminiscent of ... well ... little kids, to be exact. Combine that with a Where's Waldo-throw back seek-and-find factor, (peas are tiny, so lots of fun can be had spending time figuring out what each one is up to), and some funny, punny, well-written rhymes, and you have a picture book that goes beyond your typical concept-teaching title. In Keith Baker's hands, peas are whimsical, peas are busy, and peas are simply a very good time. I prefer the hardcover versions of the three pea books (I like larger artwork when I'm exploring detailed drawings), but note that they are available in board book format in case you want to share these on the go or with little people with messy hands. I honestly can't recommend Baker's LMNO Peas, 1-2-3 Peas, and Little Green Peas enough. I hope you'll try them out with your favorite young reader soon. Meanwhile, I'm waiting eagerly for another installment in 2016 ... maybe a concept book about pea opposites or pea feelings is just around the corner? I very much hope so. Peas out.